Stories are listed here in reverse chronological order, so the newest published stories are listed first. There is no more life force left in the universe. The attainment of immortality has depleted the world of available souls. So what do you do if you are desperate to have a child? #60 in the Land of Fright™ series of horror short stories. #59 in the Land of Fright™ series of horror short stories. What makes a civilization fall? Volcanoes, earthquakes, or other forces of nature? Barbarous invasions or assaults from hostile forces? Decline from within due to decadence and moral decay? Or could it be something more insidious? #58 in the Land of Fright™ series of horror short stories. A divorced mother of one confronts the horrible truth behind the myth of holding one’s breath when driving past a cemetery. #57 in the Land of Fright™ series of horror short stories. #56 in the Land of Fright™ series of horror short stories. A lonely schoolteacher is disturbed by how much all of the students in her class look alike. A visit by a mysterious man sheds some light on the curious situation. #55 in the Land of Fright™ series of horror short stories. #54 in the Land of Fright™ series of horror short stories. A bottle floats onto the beach of a private secluded island with an unnerving message trapped inside. #53 in the Land of Fright™ series of horror short stories. #52 in the Land of Fright™ series of horror short stories. Two couples stumble upon a zombie-themed carnival and decide to join the fun. #51 in the Land of Fright™ series of horror short stories. #50 in the Land of Fright™ series of horror short stories. #49 in the Land of Fright™ series of horror short stories. #48 in the Land of Fright™ series of horror short stories. #47 in the Land of Fright™ series of horror short stories. #46 in the Land of Fright™ series of horror short stories. #45 in the Land of Fright™ series of horror short stories. A young interstellar traveler discovers the uncomfortable truth about the Benders, the creatures who power starships with their ability to fold space-time. #44 in the Land of Fright™ series of horror short stories. #43 in the Land of Fright™ series of horror short stories. #42 in the Land of Fright™ series of horror short stories. #41 in the Land of Fright™ series of horror short stories. A young martial artist battles a vicious demon who feeds on the tormented screams and dying whimpers of his victims. #40 in the Land of Fright™ series of horror short stories. #39 in the Land of Fright™ series of horror short stories. A down-on-his-luck young man steals a magical suit off of a corpse, desperately hoping some of its power will rub off on him. #38 in the Land of Fright™ series of horror short stories. #37 in the Land of Fright™ series of horror short stories. #36 in the Land of Fright™ series of horror short stories. A detective investigates a bank robbery that appears to have been carried out by a zombie. #35 in the Land of Fright™ series of horror short stories. A senseless accident on a rural highway sets off a frightening chain of events. #34 in the Land of Fright™ series of horror short stories. In the Wild West, a desperate outlaw clings to a bullet cursed by a Gypsy… because the bullet has his name on it. #33 in the Land of Fright™ series of horror short stories. #32 in the Land of Fright™ series of horror short stories. A washed-up writer of action-adventure thrillers is menaced by the ghosts of the characters he has created. #31 in the Land of Fright™ series of horror short stories. #30 in the Land of Fright™ series of horror short stories. #29 in the Land of Fright™ series of horror short stories. A beleaguered office worker encounters a strange alien armada in the sub-basement of his office building. #28 in the Land of Fright™ series of horror short stories. Mutant dung beetles attack a family on a remote Pennsylvania highway. Yes, it’s as disgusting as it sounds. #27 in the Land of Fright™ series of horror short stories. #26 in the Land of Fright™ series of horror short stories. American soldiers in WWII uncover a nefarious Nazi plan to resurrect their dead heroes so they can rejoin the war. #25 in the Land of Fright™ series of horror short stories. #24 in the Land of Fright™ series of horror short stories. A man discovers the shot glasses in his great-grandfather’s collection can do much more than just hold a mouthful of liquor. #23 in the Land of Fright™ series of horror short stories. Two middle-aged women are tormented by a mysterious photograph in their high school yearbook. #22 in the Land of Fright™ series of horror short stories. #21 in the Land of Fright™ series of horror short stories. Two boys flee for their lives when their friendly neighborhood grasshoppers turn into deadly projectiles. #20 in the Land of Fright™ series of horror short stories. A man sees a dark future of his family in jeopardy when he watches the tiny animations of a flipbook play out in his hand. #19 in the Land of Fright™ series of horror short stories. 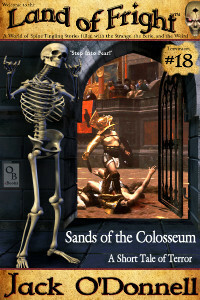 #18 in the Land of Fright™ series of horror short stories. An empty barn beckons an amateur photographer to step through its dark entrance, whispering promises of a once-in-a-lifetime shoot. #17 in the Land of Fright™ series of horror short stories. An interstellar salvage crew activates a mysterious grid on an abandoned vessel floating in space, unleashing a deadly force. #16 in the Land of Fright™ series of horror short stories. A child’s sparkler opens a doorway to another dimension and a father must enter it to save his family and his neighborhood from the ominous threat that lays beyond. #15 in the Land of Fright™ series of horror short stories. A woman on a tour of Italy with her son unwittingly awakens the ghosts of Pompeii. #14 in the Land of Fright™ series of horror short stories. A mysterious wave of dark energy from space washes over the Earth, trapping a woman and her friends in pools of light. Beyond the edges of the light, deep pockets of darkness hold much more than just empty blackness. #13 in the Land of Fright™ series of horror short stories. Savage hunters patrol the Poisoned Lands, demanding appeasement from the three survivors trapped in a surrounded building. How far will the survivors go to avoid the wrath of the hunters? #12 in the Land of Fright™ series of horror short stories. A fraud investigator discovers the disturbing truth behind the messages on a community announcement board. #11 in the Land of Fright™ series of horror short stories. An exterminator piloting an ant-sized robot comes face to face with the queen of a nest he has been assigned to destroy. #10 in the Land of Fright™ series of horror short stories. Two analysts race to uncover the secret purpose of the giant alien towers that have thundered down out of the skies. #9 in the Land of Fright™ series of horror short stories. #8 in the Land of Fright™ series of horror short stories. A lonely young woman finds her favorite secluded spot inhabited by a monster from her past. #7 in the Land of Fright™ series of horror short stories. #6 in the Land of Fright™ series of horror short stories. #5 in the Land of Fright™ series of horror short stories. In Medieval England, a warrior and his woman find the end of a massive rainbow that has filled the sky and discover the dark secret of its power. #4 in the Land of Fright™ series of horror short stories. In the land of Frawst, special snowflakes are a gift from the gods, capable of transferring the knowledge of the Ancients. A young woman searches the skies with breathless anticipation for her snowflake, but finds something far more dark and dangerous instead. #3 in the Land of Fright™ series of horror short stories. A scorned young baseball player shows his teammates he really knows how to play ball with the best of them. #2 in the Land of Fright™ series of horror short stories. A simple late-night trip to the mall for a father and his son turns into a struggle for survival when they are attacked by a deadly swarm of toy helicopters. #1 in the Land of Fright™ series of horror short stories.